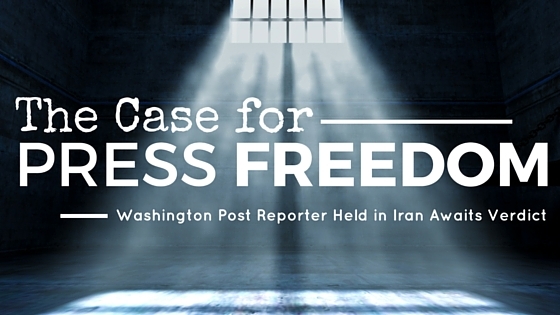 The journalism community continues to wait on a verdict in the case of a Washington Post bureau chief being held in Iran. Jason Rezaian, who was based in Tehran, was detained more than a year ago. The press club has been on the forefront of Rezaian’s case, working with Ali Rezaian, Jason’s brother and the family spokesman. Ali was part of an NPC news conference on July 22 with Washington Post executive editor Martin Baron. According to the press club, Iranian Security Forces swarmed Rezaian’s home and took him to prison on July 22, 2014. For months, he was interrogated and kept in solitary confinement with inadequate medical care and no access to a lawyer. Rezaian’s trial concluded in recent weeks. There’s been no shortage of news coverage, including this story from FishbowlDC when the trial wrapped: Jason Rezaian Trial Nearing Its End. In recent days, the Washington Post published this opinion piece, Iran’s imprisonment of Jason Rezaian is an affront to justice. And there appears to be no chance for a prisoner swap. Patrick Butler, vice president of programs with the International Center for Journalists (ICFJ), says the cases that typically garner attention involve American journalists working overseas. Freelancers also face danger when it comes to reporting stories in unsafe parts of the world. But the vast majority of journalists targeted and harassed reside in the countries they’re in, Butler says. On July 29, the press club honored Rezaian and two other journalists – Austin Tice, a freelancer detained in Syria since 2012, and Azerbaijani reporter Khadija Ismayilova, who has been jailed in her home country since December – with the 2015 John Aubuchon Press Freedom Award. Each year, the club offers the award to those whose work and lives advance the cause of press freedom and transparency. ICFJ’s Butler says the group continues to keep tabs on Ismayilova in Azerbaijan. ICFJ previously worked with her on a variety of programs.